When delving into the canon of classic cocktails, the Martini, Manhattan, Old Fashioned and Negroni are often top of mind. 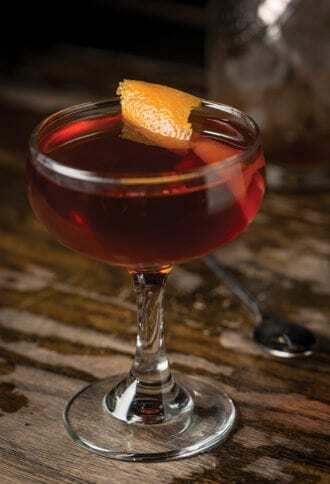 Meanwhile, the Martinez—a velvety blend of Old Tom gin, maraschino liqueur, sweet vermouth and bitters—rarely makes the list. As with many cocktails from the 1800s, no one knows exactly who invented the recipe or where it originated, though plenty of myths point to the Bay Area and the city of Martinez, as well as the Knickerbocker hotel in New York. What’s less questionable is the first mention of the cocktail in print—a reference in O.H. Byron’s 1884 Modern Bartender’s Guide with a recipe calling for Curaçao and Angostura bitters instead of today’s more common mix of maraschino liqueur and orange bitters. A version also appears in Jerry Thomas’ book in 1887 with Boker’s bitters and maraschino liqueur. Combine the ingredients in a mixing glass with ice. Stir until chilled. Strain into a chilled glass and garnish. The Founders Rubaeus gracefully walks the often-fine line between sweet and tart.